Jardin Creole � Tranquility Awaits! Beautifully appointed MAC Caribbean villa Jardin Creole awaits the discerning visitor looking for a little piece of heaven in St Martin. Located on 2.5 acres in the exclusive Terres Basses area and just a 3 minute walk from Plum Bay Beach, this luxurious 5,000 square foot villa offers generous Caribbean Sea views and ensures a tranquil oasis to allow you to recharge and relax. 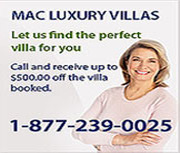 Look no further than MAC for your Caribbean vacation rentals. SPECIAL: Book one week in July or August at the beautiful Jardin Creole, and get the second week at 50% off! Email us to learn more.